My venture into the world of Doctor Who (explained here) continued into the second season. I was under the weather in the days after Christimas, and spent lots of time doing nothing but relaxing. TV was always an option, and I watched several episodes of the show. The second season was 9 serials comprising 39 episodes. Almost all the episodes exist -- only 2 are missing. The cast changes started. 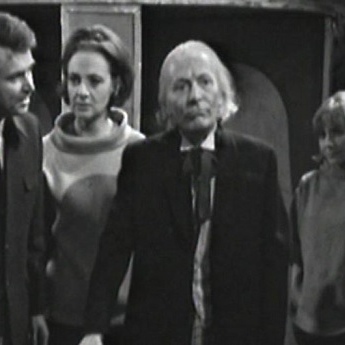 The entire complement of companions was changed by the end of the season. Carole Ann Ford, who played Susan Foreman (the Doctor's granddaughter) left early in the season because she was displeased with the development of the character. They wrote her out by having her fall in love with a farmer and having the Doctor decide she needed her own life, so he left her behind as she pleaded with him at the door of the TARDIS. In the next serial (The Rescue, 2 episodes) introduced Vicki (no last name) played by Maureen O'Brien. I read reports that the producers wanted her to cut her hair and darken it, leading her to tell them that if they wanted someone that looked like Carole Ann Ford, they ought to sign Carole Ann Ford. She kept her hair. Late in the season (The Chase, 6 episodes), Barbara Wright (Jacqueline Hill) and Ian Chesterton (William Russell) left the show. The Doctor allowed them to take a Dalek time machine and return to their own time. Sorta. They returned to 1965 London, having left 1963 London two years earlier. I wonder how they explained their disappearance from the school where they were teaching, along with one of their students. I also wonder how they knew the song Ticket To Ride. During the first episode of the serial, they all watched The Beatles performing that song on television. Barbara and Ian seemed to know it. Considering they left Earth in November 1963 before With The Beatles (the group's second UK album) has been released, and over a week before I Want To Hold Your Hand was released, there's no reason for them to be familiar with the song. Unless The Doctor had one heckuva iPod. They picked up an astronaut, Steven Taylor (Peter Purves), who stowed away aboard the TARDIS after the most recent defeat of the Daleks (The Chase). Purves got the job after having appeared as a rube from Alabama atop the Empire State Building earlier in the Dalek series that saw Barbara and Ian leave the show (The Chase). The season had three historical serials, The Romans (4 episodes, during the time of Nero), The Crusade (4 episodes, 2 missing but reconstructed via stills and the audio soundtrack, dealing with Richard I and the Third Crusade), The Time Meddler (4 episodes, set just before the Battle of Stamford Bridge). 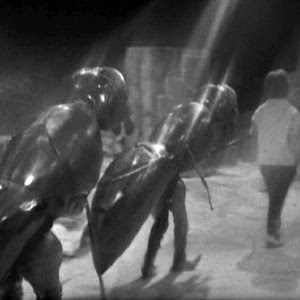 There were two serials featuring the Daleks, The Dalek Invasion of Earth (6 episodes, ending with Susan's departure) and The Chase (6 episodes, ending the Ian's and Barbara's departures). The Dalek Invasion of Earth would later be the basis for the Dr. Who movie, Daleks - Invasion Earth 2150 A.D. starring Peter Cushing (the RiffTrax crew recently had fun with that one). The really cheesy giant ants (the Zarbi) in The Web Planet gave me a chuckle. The giant butterflies (the Menoptra) in that serial were also kinda funny, as were the Optera (not really caterpillars), who where wingless butterflies with faux Japanese accents. Maybe the accents were supposed to be faux Chinese. It's hard to tell which particular Orientals were being insulted by the actors, but I lean towards the Japanese. I gather that the Daleks are the most popular villains in the Doctor Who universe. I still think they're silly, and get tired of them wanting the Doctor and his companions to be exterminated, exterminated, exterminated. Oh, well. I'll watch Season Three and see what happens. I know that the Second Doctor is in Season Four. I'm curious to see the regeneration, which so far, hasn't been mentioned. Every threat to the Doctor's life has seemed to be permanent. Perhaps they hadn't thought if it yet, and won't until they figure a way to write out William Hartnell. For now, it's back to the TARDIS. Things really pick up in the Tom Baker years -- not including the budget or special effects. Basil, you are showing your nerd.... I lived in England from '70 to '74 and lived on the Doctor. Now my 11 year old daughter has caught the bug so we have things to sit together and talk about.... much to the chagrin of my wife and teenager..... LOL As a matter of fact, she just got her first CD of Dr episodes from Amazon (paid for with her own money) and, of course, we had to buy the sonic screwdriver to go with. Much fun to be had by all here in the near future.